It’s that subject you and your dad never mentioned. He felt too awkward to talk about it, and you — fearful he’d go into graphic details on how it’s done properly and (ugh) tell the story of his first time — didn’t even know how to bring it up. Yes, we’re talking about shaving. Your dad will agree with that last point, although you and he will probably never talk about it. Here are some pointers on how to shave the right way so you and the old man can talk about more comfortable subjects, like women. Hot water opens the pores and softens the skin and hair. Ideally, you should also use an exfoliator, which will remove the dead outer layer of skin and keep the pores clean, recommends Kellett. Use a thick, nondrying shave gel and apply it in a circular motion. “If you have one, use a badger-hair shaving brush, which helps lift the hairs, allowing the razor to cut them more cleanly and minimizing the stubborn few that escape the blade,” says Dr. Jeffrey Benabio, a dermatologist and skin care expert. If you don’t have an effective, multiblade razor, you’re undermining all your other efforts. Rinse after every pass to remove hair and shave cream, and don’t press hard when shaving or you’ll be removing a layer of skin too. 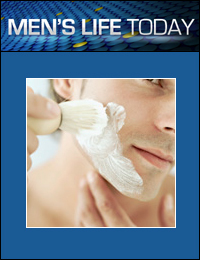 “Men don’t have to sacrifice their skin for a closer shave,” says Kellett. Just let the blade glide over your face and replace the cartridge after four or five uses. Shave in the wrong direction and you’ll scrape away a layer of skin. And keep in mind: Hair doesn’t always point downward — especially on the sideburns, chin and neck, notes Benabio. Splash with cold water to close the pores. Pat dry. Lotion or aftershave will regenerate the skin. “A gel-based one is better for acne-prone skin,” advises Kellett. Still, nicks are easier to get if you’re not meticulous. When you’re done, use moisturizer or else the area could itch for days and result in ingrown hairs — the manscape from which there’s no escape.